When I was a little kidlington, I wanted to be a tap dancer like Fred Astaire, and was very disappointed to find that the tap lessons I took started with the basic basics, rather than cutting straight to the spectacular fast tapping routine. My dance school kept trying to get me interested in doing other dances, and even managed at one point to get me to take a folk dancing exam, but my heart was never in it. 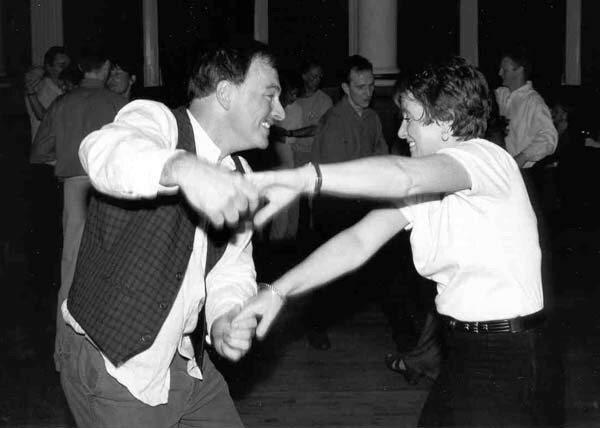 Several years ago, I took up partner dancing, in the form of modern jive, as taught by the CerocÂ® Megacorporation. How I wish I learned to partner dance ten years before I did. I'd have wowed the chicks at university. Anyway, since starting with jive, I've tried many other styles, including salsa, merengue, tango, shag, and my great love: Lindy hop. Ceroc® is a trade name, of a school with many branches, which teaches modern jive. There are many other schools of modern jive, many of which do the same as the Ceroc® schools, that is, they pretend that what they teach is entirely unique to themselves. In truth, modern jive is modern jive, and the difference between the schools lies not really in what they teach, but in how well they teach it, and how good the atmosphere is at the dances they hold. One of my shots of dancers at a Ceroc® bash. It is very difficult to focus on dancers doing a fast improvised dance in a dark room lit with flashing coloured lights, and harder still to catch the moment with the shutter, but I've managed it a few times. The first lesson I went to of Ceroc®, I remember very well. There was a basic lesson of four linked moves to start with. When I first saw the routine, I thought that it would be a great challenge. Actually, it was quite manageable, and I gave the intermediate lesson later in the evening a go too, and I found that I could muddle through. After my first lesson, there was a time for "freestyle" dancing, that is, they put on music, and people then dance with each other to it, not to a routine, but to what they make up on the spot. When jiving, the man leads a move from his vocabulary of learned or invented moves, and the lady follows, while the man tries to work out what he's going to lead next. Neither task is much easier than the other, but for a beginner, it is generally easier to be the woman, since you need only learn the knack of following, and don't have to learn all the moves. A dance to a musical number consists of a series of moves, most of which will be familiar to both partners, but linked together in whatever way the man decides. I was flattered that a lady asked me to dance. "Okay," I said, "but be aware that I know four moves." As it turned out, I managed to make my four moves, linked in varying orders, last the whole number. It wouldn't have been the lady's best ever dance, but it gave me confidence. For the weeks that followed, my every Ceroc® evening was a highlight. 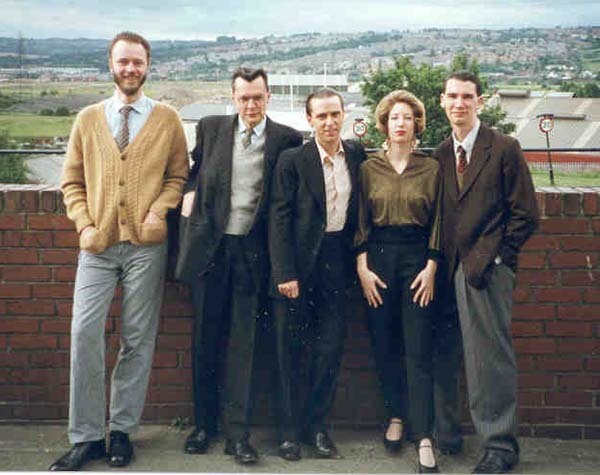 I'm on the left of this group shot of five of us from the Newcastle branch of Ceroc® who were hired as extras to jive in the TV drama The Round Tower by Catherine Cookson. It's amazing how 1950s clothing adds ten years to a person's apparent age. I am actually only twelve. There is much to like about Ceroc®. Jive is a versatile dance that can be danced to slow gliding numbers, or fast rock and roll, and much else besides. Some moves are nice and simple, while others are dead flash. I can ask someone who has never danced jive at all, and in minutes have them following a reasonably complicated routine. Jive can be danced in so many different styles, that it can be a very interpretative dance, each move tailored to fit the mood and rhythm of the music. See how happy this makes people? a good dance really makes you feel great. There are branches of the Ceroc® Empire all over Britain, with a few abroad, notably in the lands Down Under. This network is an asset which Ceroc® has - members can attend any branch, and it is a way to meet people. There are also bigger events, for which people often travel a long way. Some people note how differently people from around the nation do Ceroc®. The main difference I have noted is that the folks down south seem to wear fewer clothes. Crop-tops are very popular with the southerners. I might approve were it exclusively the women who wear them. I like this shot. It appears to show two people dancing not with the smooth smug grace of the seasoned, but with the have-a-go enthusiasm of those out for a good time. The best dance partners don't care if you get a move wrong, they just incorporate whatever you do into their dance. If things come crashing to a halt, then the best thing to do is laugh. Few have so much fun as beginners. There are drawbacks to Ceroc®, however, though these only become apparent once you have been doing it for a while. One is that the dance is deliberately taught with little reference to footwork. At first, this is a boon, since it means that beginners can get up and dance quickly, without all that complicated worrying about where their feet are. It also means that people like me are free to make up whatever footwork they please. Unfortunately, since people are not required to use fancy hoof-shuffling, most never do. Many people are content to let their feet do the minimum. Another minus point is that the Ceroc® Headquarters has, in its wisdom, decided that Ceroc® is more appealing to customers if the music consists largely of modern chart hits, and a small number of established Ceroc® favourites. True, one can dance Ceroc® to just about anything, but this doesn't mean that any music is good for this purpose. All Ceroc® venues play a lot of the same awful music, which lacks off-beat, breaks, interesting rhythm, and is too fast to do a nice slow dance to, but too slow to have a nice energetic bop. Another thing, is all this "®" stuff. You may have detected in my choice of such words as "Empire" and "Megacorporation", that I have a rather cynical attitude to the business side of Ceroc®. They have a number of annoying and probably foolish policies. People promoting (or even, in extreme cases, attending) other dance events and schools, have been known to be banned from Ceroc® events. I once discovered that there would be a big-band competition at a venue in Newcastle, which had a huge dance floor. I 'phoned the organiser, and he was delighted with my idea of bringing along a few dozen jive dancers to shuffle away to authentic big band music. I contacted the Ceroc® people, and they refused to tell anyone about this, because it was not an official Ceroc® event. Fools, say I, because that event would have been a perfect recruiting opportunity. Who attends big-band competitions other than people interested in that sort of music? Would not these people often think to themselves "I wish I knew of somewhere where I could go to learn how to dance to this sort of stuff?"? 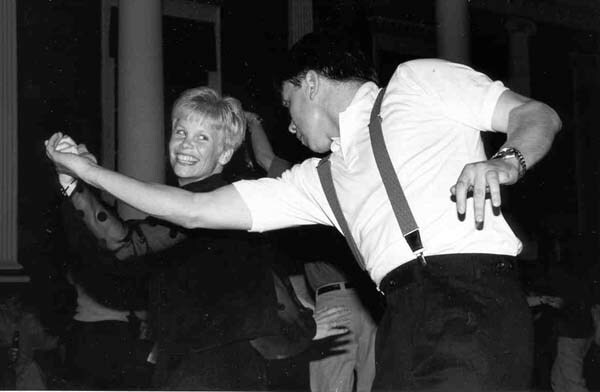 Having gone Cerocking, or whatever the verb is, for over three years, I found that the shine was wearing off, but through my modern jive, I built up many dance contacts, and got into Lindy hop (otherwise known as swing or jitterbug). I would not now be a Lindy hopper were it not for my time with Ceroc®, so I have to thank Ceroc® for that, and there are many others like me. Oh yes - we can dance in colour too. To illustrate the power of dance, know that the lovely lady on the right is both a Ceroc® teacher, and was called "Dance". I say "was", because the chap on the left so impressed her with his fine dance prowess, that she married him, despite his having worn those awful jeans. Visit the CEROC® web site.